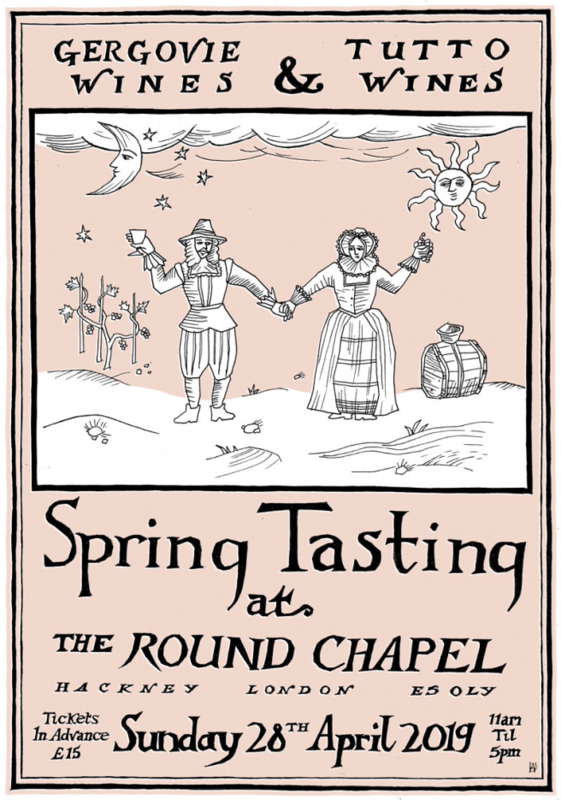 On Sunday 28th April we are teaming up with our friends Gergovie Wines for this year’s Spring Tasting at the Round Chapel in Hackney. We’ve never sold tickets in advance so have no idea how long they will last, but given there are a lot less to go around, if you would like to come along we suggest purchasing them as soon as possible to avoid disappointment. This a tasting that is all about the growers and this year’s lineup is looking like the best yet. If you are in need of sustenance or refreshment, there will again be coffee and pastries from Browns of Brockley, food from 40 Maltby Street and beer from The Kernel. We will also have Harry and Anna’s beautiful prints and t-shirts for sale, featuring the above artwork. We hope you can join us for what promises to be a beautiful day.